Made of razor-thin manufacturer’s porcelain, the TOUCHÉ series captivates thanks to its sophisticated elegance and special smooth feel. The special insulating effect of the cups, created by the double-walled yet extremely light-weight design, also testifies to the technological sophistication. The series is comprised of a bowl, one small cup and one large mug, matching saucers and a breakfast plate. The articles, which are available in a matt polished version in white as well as decorated with relief, are suitable for both hot and cold drinks. The minimalist design of the series along with its matt polished outer finish and the high-gloss glazing on the inside are a joy for the eyes to behold – and for the fingers, every time they touch this unique porcelain. The TOUCHÉ series captivates thanks to its exceptionally smooth feel and double-walled design with its special insulating effect. The handleless TOUCHÉ cups turn hot and cold beverages into an experience of aroma, taste, aesthetics and sensation – a joy for all the senses. The masterful refinement is truly characteristic of FÜRSTENBERG: with a wall thickness of just 1.2 to 1.5 millimetres, the mug weighs about half of what a regular coffee cup weighs. The delicate material lends the items a virtually "weightless" sensation. All TOUCHÉ cups have a high-gloss glazing on the inside and a matt polished finish on the outside that is sealed and resistant against discolouration. The series is further enhanced by matching white saucers and a breakfast plate. Schools of fish swim between the waves, pufferfish and octopus enchant with their bizarre beauty and crayfish and sea urchins bustle about. With LA MER – the extension of the cup series TOUCHÉ – Porzellanmanufaktur FÜRSTENBERG whisks you away to the depths of the ocean. The new, highly detailed reliefs boasting various creatures of the deep-blue sea on a mat outer finish of the series' filigree cups are a joy for the eyes to behold – and for the fingers, every time they touch this unique porcelain. The delicate sheen of discreet turquoise celadon glaze on the inside is reminiscent of a fascinating underwater display of light. With its ZODIAQUE line, FÜRSTENBERG adds a new mug to the TOUCHÉ series every year with the relief of a traditional sign of the zodiac. Inspired by the Chinese zodiac, the special edition is adorned by the motifs dragon (2012), snake (2013), horse (2014), sheep (2015) and monkey (2016). For 2017, FÜRSTENBERG presents the relief rooster, which symbolizes pride and authority as well as honesty and sociability. The ZODIAQUE designs were designed with great attention to detail by various artists and elaborately transferred to the cups and mugs by the porcelain makers in Fürstenberg with greatest authenticity and precision. The sophisticated TOUCHÉ cup series is one of the flagship designs from the traditional porcelain manufacturer FÜRSTENBERG. Made of wafer-thin white porcelain, the filigree elegance and technical refinement of these fine TOUCHÉ goblets is simply captivating. TOUCHÉ has a special thermal effect thanks to their unique double-walled design. TOUCHÉ promises unique drinking pleasure for all kinds of drinks, whether hot or cold. 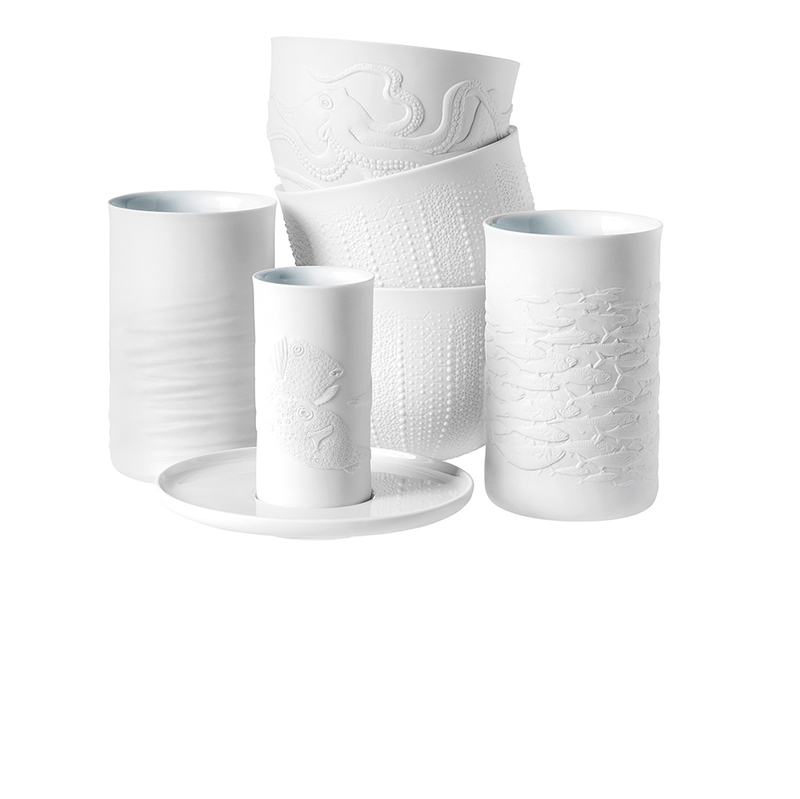 The cups of TOUCHÉ are available in three sizes and special relief variations. With their minimalist shapes, matte polished exterior and glossy interior glaze, TOUCHÉ is not only visually attractive but also a real pleasure to hold. An elegant breakfast and cake plate rounds the series TOUCHÉ off. The cups in the TOUCHÉ series have been created both for the demanding requirements of gourmet cuisine and for savouring tea and coffee at home. 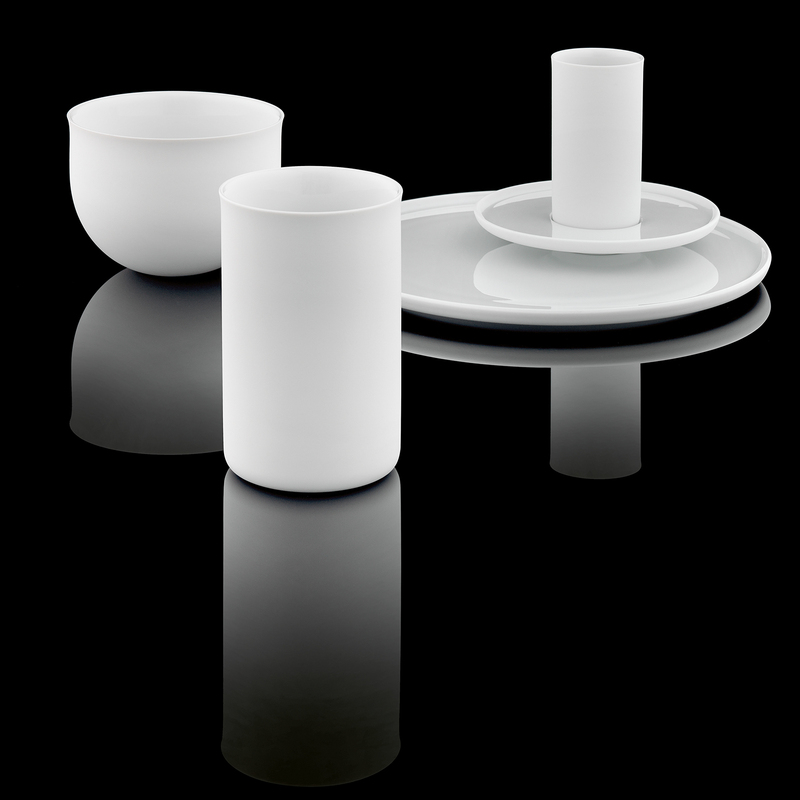 The series consists of a large cylindrical cup, a tea bowl and a small cup that is perfect for espresso. Despite their lightness – the large TOUCHÉ cup weighs just 165 grammes, which is only around half the weight of a normal coffee cup – FÜRSTENBERG has managed to incorporate a thermal effect thanks to the double-walled design of TOUCHÉ. The thickness of the porcelain is only 1.2 to 1.5 millimetres. This delicate material of TOUCHÉ therefore feels almost “weightless” to hold. And while keeping coffee or tea hot and champagne or cocktails cold, the outside of the TOUCHÉ cup remains at a pleasant room temperature. This makes it very comfortable both for serving and drinking. 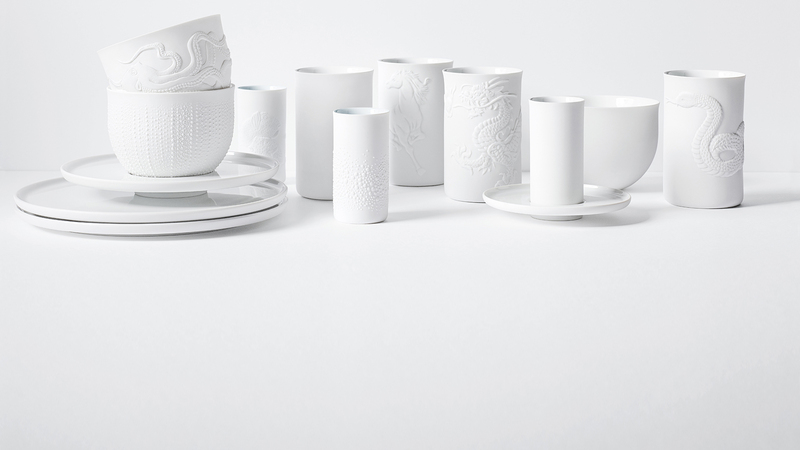 Inspired by the Chinese horoscope, the large TOUCHÉ cup is also available with a relief of traditional signs of the zodiac. 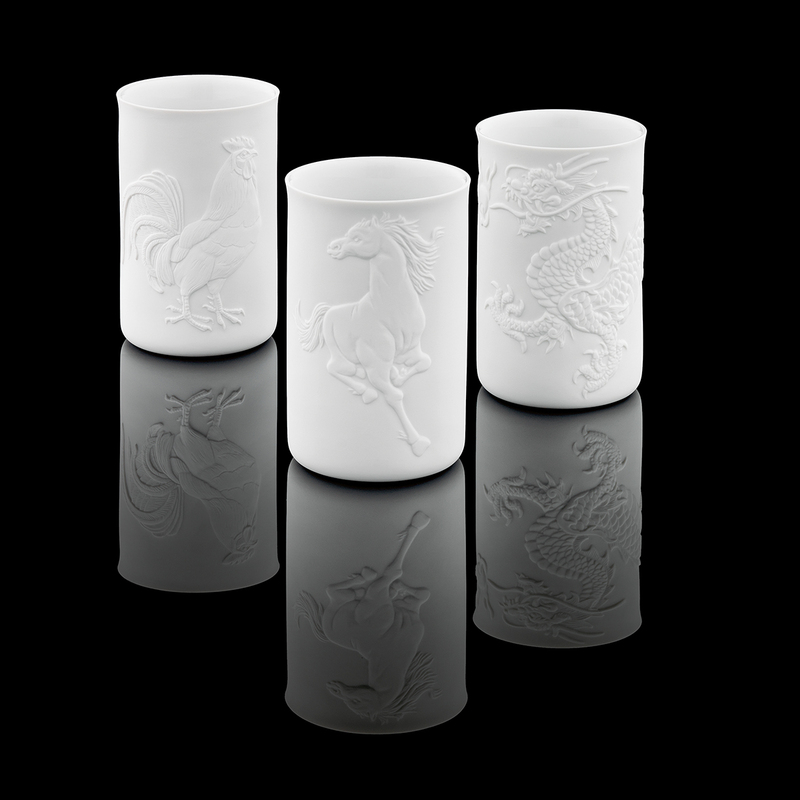 Besides the dragon motif of 2012 and the snake in 2013, the cup series has been continued with a horse relief for 2014. The horse symbolises temperament and elegance. The reliefs were designed by an Asian artist with painstaking attention to detail. The relief designs have been meticulously, authentically and precisely recreated from the original. They are only apparent on the surface of TOUCHÉ and do not show through to the inside. Another addition to the TOUCHÉ series is the elegant breakfast and cake plate, which gives the series further possible uses. A universal saucer goes with the large TOUCHÉ cup and the TOUCHÉ tea bowl, while the espresso version has its own small saucer. 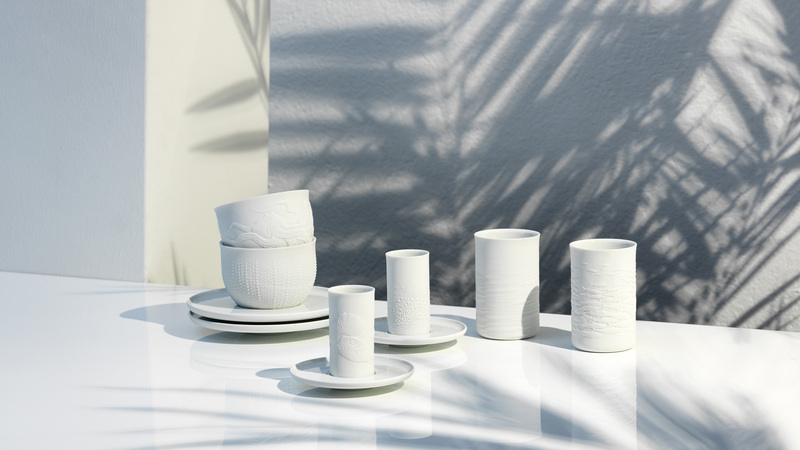 To achieve the unique, sand-blasted look and feel, the exterior of the cups is matt polished by the FÜRSTENBERG master craftsmen. With use, a further, invisible benefit becomes apparent: the surface of TOUCHÉ is sealed and therefore resistant to staining and soiling. With these cups and the whole TOUCHÉ series, FÜRSTENBERG demonstrates once again how modern porcelain manufacture is based on an inseparable marriage of technical precision and sophisticated aesthetics.